A dental laboratory technician is a dental professional who creates and repairs dental devices such as a denture, bridge or crown. They have an incredibly specialised job in that their work must be both functionally and esthetically pleasing to the dentist and the patient who is fitted with the device. They also work with specialised digital and manual equipment such as computers, scanners and tiny hand drills. While there are many different areas of dentistry where a dental laboratory technician can potentially work, some choose specific, focused labs that specialise in a particular side of the business. 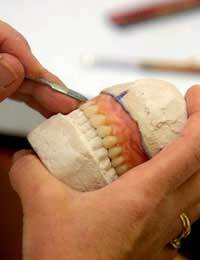 One dental laboratory technician may work mostly in orthodontics while others primarily do crowns and bridges. You can work in a number of locations as well. Some dental laboratory technicians may choose to work independently while others will work in a dentist’s office, hospital or private company that manufactures dental devices. Typical dental laboratories are relatively small, with only two to six people working. Dental laboratory technicians have a very specialised skill set. Today’s professionals are often trained in CAD/CAM dentistry, which uses a digital workflow to improve efficiency and precision when creating the end product for the dentist and patient. Having strong communication skills is an essential component of success, as you will be connecting with dentists and other dental professionals each day. Following specific instructions is similarly critical for a lucrative career in this dental field. You should enjoy hands-on work and also be comfortable sitting for extended periods of time. In this field, you will have to constantly be training to ensure you stay up-to-date on the newest materials to use and the techniques available and in-demand. If you are running your own laboratory, there is also the addition of marketing and promotions to take into account. Your client will be the dentist. Therefore, pleasing the patient means pleasing your client – the dentist, to ensure devices are not sent back for poor quality or fit. Much of the salary for self-employed individuals will relate to how well you manage your business and the choice of products as well – high-end or lower cost, plus your margins on the products. A starting salary working for an employer is low compared to many other health careers, and tends to be around twenty thousand pounds a year. For those who properly start and grow their business, however, earning potential is significantly higher, particularly in niche markets with higher-end products that have a high profit margin. Course requirements vary but on average, you can expect at least two years of university coursework for a successful career as a dental laboratory technician. Many students complete four-year courses, complete with significant practical components. Certification exams ensure you are qualified and also help to show your clients that you meet specific standards. Prospects are considered good as more awareness is spreading with regards to the available treatment options for damaged, misaligned or missing teeth. Your first step should be to speak to an academic advisor at a university that offers the courses. It’s also helpful to talk to a few people working in the field to understand the benefits and also challenges in establishing a practice or working within someone else’s business. For those who relish the idea of helping patients to better function and enhance their confidence from a new smile, a career as a dental laboratory technician is an excellent choice. Here, you will have the opportunity to combine your artistic skills and scientific knowledge to create a beautiful, functional device that improves patient quality of life.